Drape backdrops are a must-have for weddings, birthday parties, conventions, or any other event where you want to showcase special people. They are very versatile as well. They can used on or off-stage. They can used as photo backdrops, or to accent lighting or as a background to project a GOBO design. The possibilities with drape backdrops are endless! Our pipe and drape systems are fully adjustable. When it come to height or length required, they can cover it all. And they can be used with just about any fabric imaginable. Simply, they transform the room. Their primary function is to serve as dividers, however, there are many other applications. They can help to make the room appear smaller and more intimate. Or they can be used to cover unsightly storage areas. They make the perfect separation for booths at conventions. 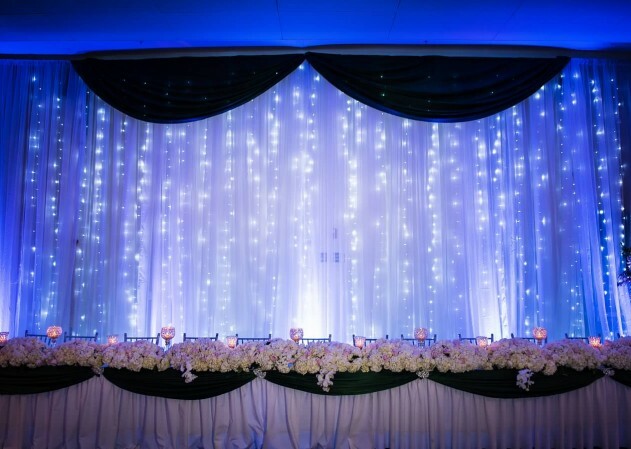 Most often drape backdrops are constructed behind the head table at wedding receptions. Our drape is always spotless and without holes or tears. We meticulously maintain and clean them after every event. Not only that, but our equipment is safe as well. None of our pipe and drape gear is cracked, worn, or bent. We use plenty of sandbags whenever pipes or truss is employed. With all of our safety measures employed, don’t be worried about the look of your event. We like to keep our setups looking clean. We have a plethora of pipe and bass covers at our disposal. You can always expect first-rate service and equipment from Bliss Entertainment.